Time to tally up March's dividend results. Here is how much cash I received in March 2019. All cash was reinvested back. March along with January were very good months this year. A large improvement over last year's similar quarters. The increase largely comes from my aggressive contributions in the winter. And last year's dividend raises were significant due to the corporate tax cuts. 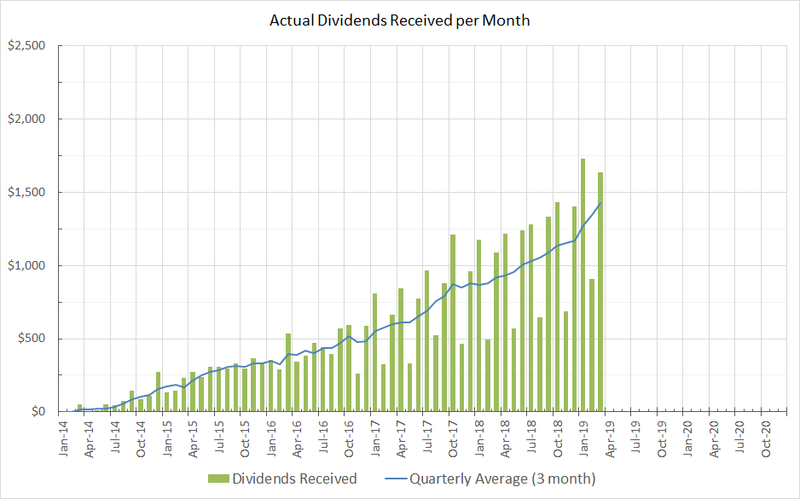 The dividend growth momentum is very strong right now in my portfolio. In the coming April I am expecting $1670 in dividends and May will be around $950. As of today my portfolio pays a total of $17,306 in dividends per year. That's just fantastic YD! Over $1600 for March is huge and you're almost to that illustrious $1k in every month mark although you're well over that based on your monthly average. That's a huge tipping point in my eyes. With over $17k of forward dividends that's like having your own minimum wage employee out there working 40 hrs a week 50 weeks a year and giving you all of the income. Keep it up! That is a massive month, and how good is that graph! It truly shows your hard work. Keep it up! That is just huge. And you are anticipating a monster April? Geesh, on a tear!